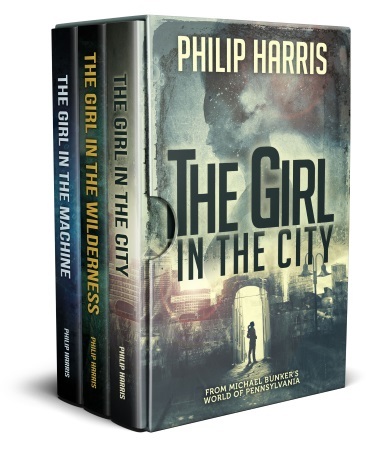 I’ve created a box set of all three of my Leah King ebooks (The Girl in the City, The Girl in the Wilderness, and The Girl in the Machine). Yes, they don’t really come in a box but you know what I mean. I tried to up the stakes and the action with each successive book, and I’m very pleased with how the trilogy turned out. More importantly, readers seem to agree. Feedback on all three books has been excellent. The normal price for the set will be $5.99 but for a short time I’m offering the complete set for the ridiculous price of 99c/99p. That’s over 500 pages of dystopian cyberpunky science fiction goodness for less than a dollar/pound/whatever the equivalent is in your country. Or to put it another way, about $6 less than the books cost individually. So, if you haven’t read any of these, or you’ve read the first one or two, now is the time to pick it up. You can get your copy from Amazon right now by clicking HERE. With the oppressive Transport Authority controlling every aspect of their existence, Leah and her father do what they can to carve out a good life for themselves. Leah spends her nights scavenging, risking capture as she hunts for salvage her father can trade for food and clothing. When Leah takes a bag of salvage from a dying stranger, she and her father are plunged into the world of Transport and its war against the terrorist organization, TRACE. As she is drawn deeper into the war, Leah must decide who she can trust, and how far she’ll go to uncover her past. The Hunger Games meets William Gibson in this gripping dystopian science fiction trilogy. I’ll be sending my short story collection to all of my newsletter subscribers once it’s complete so if you sign up now, you’ll get four free ebooks, plus the new collection later this year. CLICK HERE to get started.